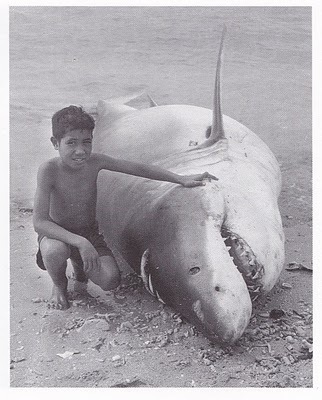 I doubt this little boy would be so chummy with Mr. Shark if they were both swimming in the water. The image was posted today on The Best Shark Dive in the World! blog. Yes, this is apparently a picture from Fiji! The caption reads 'Jaws' of the South Pacific. A shark on the beach, 1956. I found it by pure chance when leafing through Fiji in the Forties and Fifties, a collection of pictures by local photographer Robertson Rob Ramsey Wright, 1906-1976. And for an interesting “Shark in a Crowd” photo, check this one out at The Best Shark Dive in the World!